One thing I really like about recipe swaps is not only do you get to try something you might not have otherwise tried, and visit new blogs, but new people are introduced to your blog as well. A few swaps ago, that had a Bloggers Choice theme, Melissa from I was Born to Cook was assigned my blog. 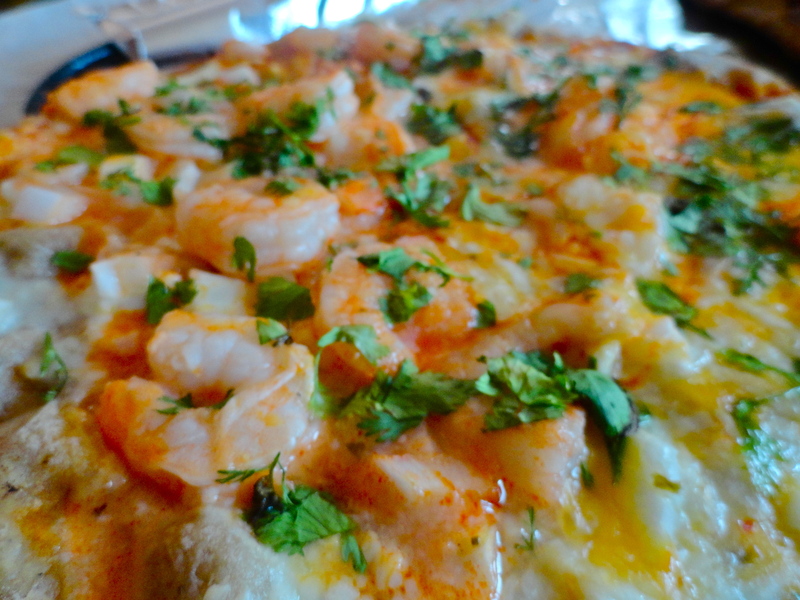 She made my buffalo chicken pizza, but instead of chicken, she used shrimp. I thought this was an absolutely genius idea! I used basically the same recipe as I used before, and substituted shrimp for chicken. This was so quick and simple to throw together because I used dough that I had previously made, separated into individual pizzas, and froze. I let the dough thaw, rolled it out, and we were good to go. I used precooked shrimp and just needed to remove the tails. Everything else comes together in a cinch. Except if your grill catches on fire. Then your crust might get slightly crispy and a nice shade of black on the bottom. Trust me! 1. Prepare dough according to grilled pizza dough recipe, whole wheat pizza dough, your own crust recipe, or use a pre-made crust. Follow directions until it comes to adding toppings to your pizza. Spread with garlic cream sauce, leaving just 1/4 – 1/2 inch crust around the outside. 2. In a small bowl, combine shrimp with red pepper sauce. 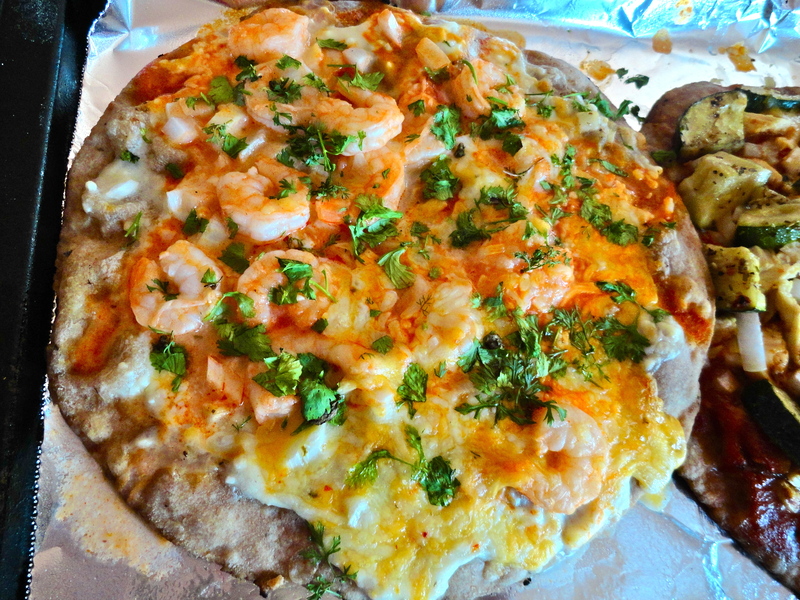 Sprinkle shrimp evenly around the pizza, then add onions and cheese. Cook according to the crust recipe’s specifications and top is bubbling and cheese begins to turn brown. 3. Before serving, top with cilantro and more red pepper sauce if desired. Slice and serve. 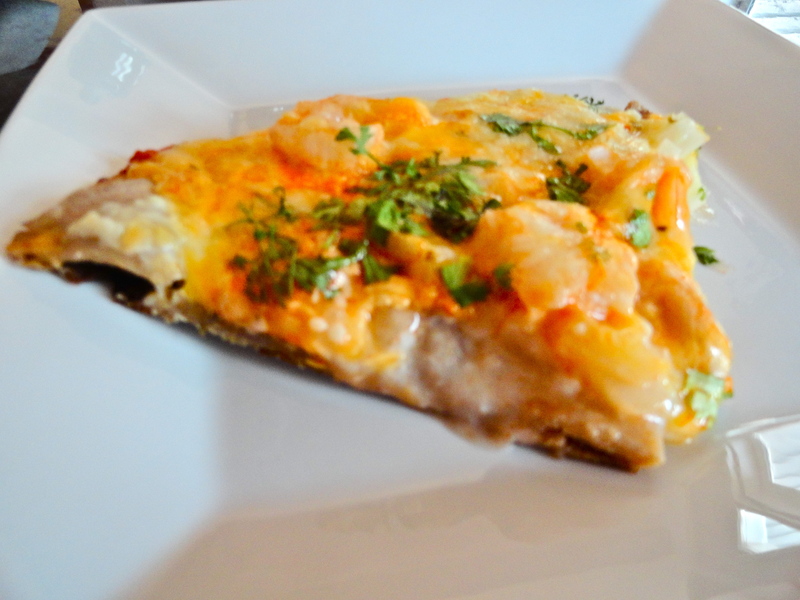 oh man, this was one of our absolute favorites…I need to make it again soon!